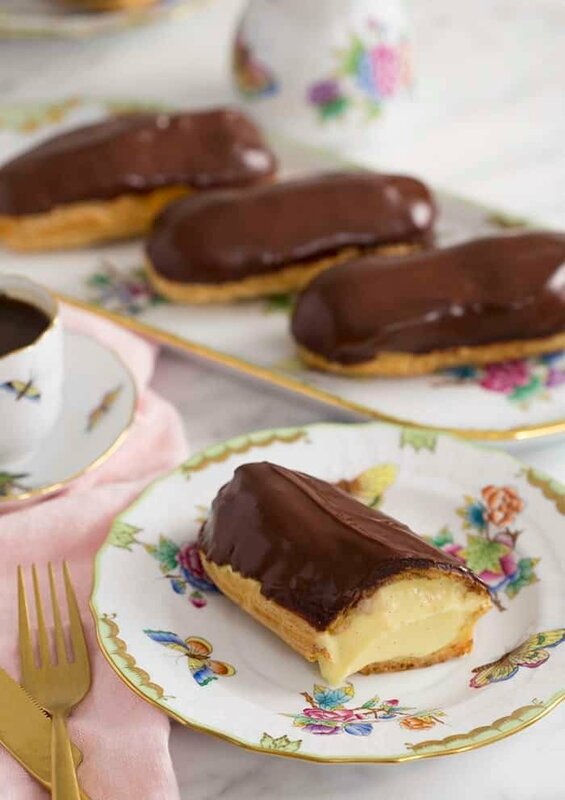 These ridiculously delicious chocolate eclairs filled with vanilla pastry cream are nearly foolproof to make and will be gone in a flash, éclair actually translates to “flash of lightning”! These delicious eclairs look fancier and more difficult to make than they actually are. The airy choux pastry is SUPER EASY to work with and VERY versatile. Not to mention the pastry cream is basically the best thing to come out of France… Ever. I ate four before I got to the dinner party. Shhhh our secret! Are eclairs French or Italian? Eclairs are French in origin, dating from the mid 1800’s. The name means “flash of lightning” in French as they are eaten in a flash! How long do chocolate eclairs last? Eclairs are best when served within a few hours of assembly. If you have to they are still delicious the next day. Make sure to refrigerate them in a sealed or covered container. You can make the shells and pastry cream a few days in advance and keep them in a sealed container at room temperature then fill and dip them before serving. The shells can be frozen and kept for 2 months before being thawed and filled. Are eclairs and profiteroles the same? Both are made with choux and stuffed with a creamy filling but a profiterole is often frozen, sometimes cut lengthwise and filled with ice cream. Profiterole is an old word referring to breads baked under the ashes. How long do cream puffs last? Like eclairs cream puffs will last overnight is refrigerated. If you need to make them further in advance try baking the choux puffs and freezing them. You can make the custard filling a day in advance as long as you refrigerate it. How do you make Chocolate Eclairs? For the pastry; preheat the oven to 425 degrees and line a sheet pan with parchment paper. In a large saucepan, bring the water, butter, salt and sugar to a rolling boil over medium-high heat. Once it boils, immediately remove the pan from the stove. Stirring with a wooden spoon, add all of the flour at once and stir until the flour is incorporated, 30 to 60 seconds. Return the pan to the heat and cook while stirring for 30 seconds. Scrape the mixture into a standing mixer fitted with a paddle attachment. (You can also use a hand mixer). Mix at medium speed and add 3 eggs, one at a time. Stop mixing after each addition to scrape down the sides of the bowl. Mix until the dough is smooth and glossy and the eggs are completely incorporated. The dough should be thick, but should fall slowly and steadily from the beaters when you lift it out of the bowl. If the dough is still clinging to the beaters, add the remaining 1 egg and mix until it’s fully incorporated. Using a pasty bag fitted with a large plain tip, pipe fat lengths of dough (about the size and shape of a jumbo hot dog) onto the lined baking sheet. Leave 2 inches of space between each one. You should have 8 to 10 lengths. 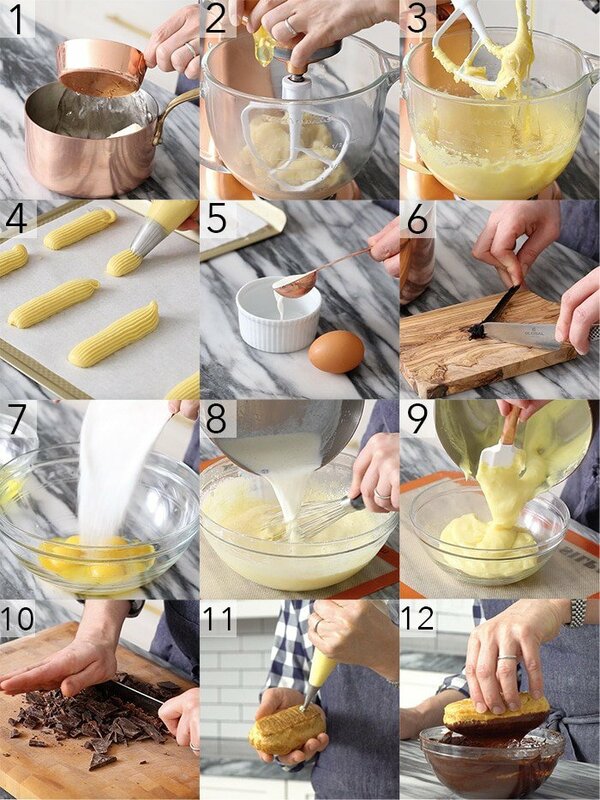 For the egg wash; whisk the egg and water together, then brush the surface of each eclair with the egg wash. Use your fingers to smooth out any bumps or points of dough that remain on the surface. Bake them for 15 minutes, then reduce the heat to 375 degrees and bake until puffed up and light golden brown. About 25 minutes more. Poke holes in the bottom after baking so the steam can be released. This will prevent them from getting soggy. For the filling; cut open the vanilla bean and scrape out the inside. Add it to a medium saucepan with the milk and bring it to a boil over medium heat. Immediately turn off the heat and set it aside to infuse for 15 minutes. In a separate bowl, add the egg yolks and sugar and whisk them together until they are light and fluffy. Now sift the cornstarch in and whisk the mixture vigorously until no lumps remain. Now whisk in 1/4 cup of the hot milk mixture and whisk until it’s fully incorporated. Whisk in the remaining hot milk mixture reserved in the saucepan, then pour the mixture through a strainer back into the saucepan. Cook it over medium-high heat, whisking constantly until thickened and slowly boiling. Remove it from the heat and stir in the butter. Let it cool slightly then cover it with plastic wrap, lightly pressing the plastic against the surface to prevent a skin from forming. Chill it for at least 2 hours until ready to serve. You can whip up some whipped cream and fold it into your custard to lighten the filling up. That is technically called Ambassador cream. For the chocolate ganache; chop the chocolate and put it into a medium sized bowl. Heat the cream over medium heat just until it boils, then immediately turn off the heat and pour it over the chocolate. Wait a couple minutes then whisk until it’s fully melted and smooth. (This glaze can be made 48 hours in advanced). Fit a medium-sized plain pastry tip over your index finger and use it to make a hole in the end of each eclair. Using a pasty bag fitted with a medium-sized plain tip, gently pipe the custard into the eclairs, but only just enough to fill the inside (don’t stuff them full). Go ahead and add some more cream to the chocolate if you need. Dip the tops of the eclairs in the warm chocolate glaze and set them on a sheet pan. Chill the eclairs uncovered for at least 1 hurt set the glaze and serve them chilled as well. Enjoy! 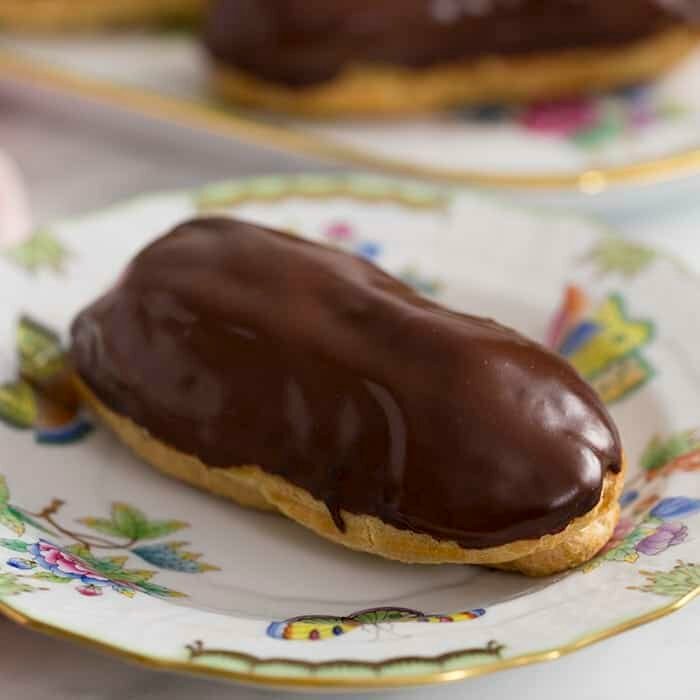 If you’ve tried these eclairs then don’t forget to rate the recipe and let me know how you got on in the comments below, I love hearing from you! Scrumptious, light as air pastries filled with dreamy vanilla pastry cream and dipped in chocolate. These treats will be gone in a flash!! In a medium saucepan, heat the milk and vanilla bean to a boil over medium heat. Immediately turn off the heat and set aside to infuse for 15 minutes. In a bowl, whisk the egg yolks and sugar until light and fluffy. Add the cornstarch and whisk vigorously until no lumps remain. Whisk in 1/4 cup of the hot milk mixture until incorporated. Whisk in the remaining hot milk mixture, reserving the saucepan. Pour the mixture through a strainer back into the saucepan. Cook over medium-high heat, whisking constantly, until thickened and slowly boiling. Remove from the heat and stir in the butter. Let cool slightly. Cover with plastic wrap, lightly pressing the plastic against the surface to prevent a skin from forming. Chill at least 2 hours or until ready to serve. The custard can be made up to 24 hours in advance. Refrigerate until 1 hour before using. I whipped some cream up and folded it into my chilled custard to lighten the filling up, this is now technically called Ambassador Cream. Preheat the oven to 425 degrees. Line a sheet pan with parchment paper. In a large saucepan, bring the water, butter, salt and sugar to a rolling boil over medium-high heat. When it boils, immediately take the pan off the heat. Stirring with a wooden spoon, add all the flour at once and stir hard until all the flour is incorporated, 30 to 60 seconds. Return to the heat and cook, stirring, 30 seconds. Scrape the mixture into a mixer fitted with a paddle attachment (or use a hand mixer). Mix at medium speed. With the mixer running, add 3 eggs, 1 egg at a time. Stop mixing after each addition to scrape down the sides of the bowl. Mix until the dough is smooth and glossy and the eggs are completely incorporated. The dough should be thick, but should fall slowly and steadily from the beaters when you lift them out of the bowl. If the dough is still clinging to the beaters, add the remaining 1 egg and mix until incorporated. Using a pastry bag fitted with a large plain tip, pipe fat lengths of dough (about the size and shape of a jumbo hot dog) onto the lined baking sheet, leaving 2 inches of space between them. 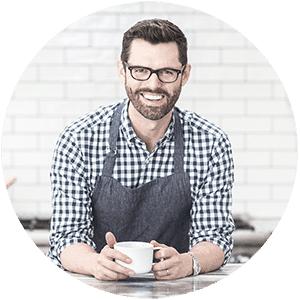 You can also make fat dots if you want ti make smaller servings. You should have 8 to 10 lengths. If they look horrible like the ones pictured above, don't worry! The egg wash will fix it. Egg Wash: In a bowl, whisk the egg and water together. Brush the surface of each eclair with the egg wash. Use your fingers to smooth out any bumps of points of dough that remain on the surface. Bake 15 minutes, then reduce the heat to 375 degrees and bake until puffed up and light golden brown, about 25 minutes more. Try not to open the oven door too often during the baking. Let cool on the baking sheet. Fit a medium-size plain pastry tip over your index finger and use it to make a hole in the end of each eclair (or just use your fingertip). 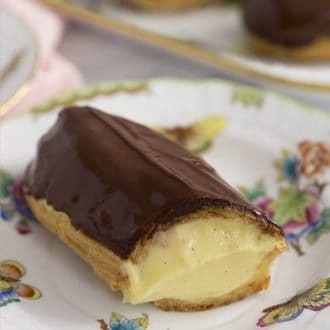 Using a pastry bag fitted with a medium-size plain tip, gently pipe the custard into the eclairs, using only just enough to fill the inside (don't stuff them full). In a small saucepan, heat the cream over medium heat just until it boils. Immediately turn off the heat. Put the chocolate in a medium bowl. Pour the hot cream over the chocolate and whisk until melted and smooth. Set aside and keep warm. The glaze can be made up to 48 hours in advance. Cover and refrigerate until ready to use, and rewarm in a microwave or over hot water when ready to use. Poke holes in the bottom after baking so the steam can be released. This will prevent them from getting soggy. Previous Post: « Chocolate Donuts! I enjoyed making these eclaires with my family this weekend!